Diffusers and lip balms and oils, oh my! Start your morning with a pampering shower, diffuse a fresh aroma during errands, and wrap up the day with a meal of einkorn and Vitality™. 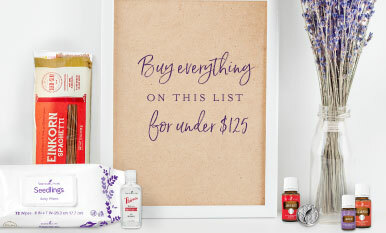 Get all 13 of these YL goodies for under $125! From diapers and outfits to bath and stroller accessories, the list of items on a baby shower registry can be pretty predictable, but you want to help welcome the new baby with a gift that is as distinctive and useful as it is thoughtful. Why not create a themed, essential oil-infused gift basket that shows just how much you care? Check out these fun ideas!